Do You Really Want a 5-Star Rating? Does your organization really want five-star reviews across the board? It’s easy to dismiss the question as silly. Of course you want five-star reviews (!) — especially in the age of Yelp, Facebook, and TripAdvisor. If the kind of customer feedback posted publicly on online review sites and social media channels can indeed make or break your business, wouldn’t you rather everything be positive and perfect and full of praise? We won’t stop you from pursuing perfection. But a new study by Northwestern University’s Spiegel Research Center and PowerReviews should encourage companies to consider more carefully the kind of impact online reviews — the glowing ones, specifically — have on business performance. According to the study, entitled “From Reviews to Revenue: How Star Ratings and Review Content Influence Purchase”, product purchases were most influenced by reviews with an average rating of 4.2 to 4.5 stars out of 5 — making this the ideal average star rating for purchase probability. Reviews and ratings matter even more for people shopping for big-ticket items like appliances, electronics, and computers. The ideal number of reviews depends on the length of the reviews’ text content. When a business’ reviews are shorter, quantity matters more to consumers. But if the reviews are lengthier, quantity has a less significant impact. Overall, the relationship between ratings and purchase is not as linear or straightforward as one may think. For one, a perfect five-star rating doesn’t guarantee a purchase. Also, reviews and ratings that are between one to three stars (out of five) actually have little effect on a purchase, but when these surpass three stars, purchase likelihood increases. The study brings to light certain nuances and distinctions in the way online ratings and reviews influence consumer behavior, which companies should take into account when developing an online review management strategy. Not only do critical comments on review sites and social media offer valuable insights on how your business can improve; they also bolster your online brand reputation with a measure of authenticity and transparency. Just because a five-star rating may be perceived by consumers as too good to be true doesn’t mean you shouldn’t shoot for perfection. Continue to focus on building amazing products and services, as well as on delivering superior customer experiences. At the same time, you must recognize that your business will attract customers who, for one reason or another, fair or not, are going to be very difficult to please. And this is okay. Even the most visible and successful organizations on, say, Yelp or TripAdvisor or Facebook are not immune to receiving negative customer feedback. In light of PowerReviews and Northwestern’s study, it’s important that you’re able to resist the desire to delete, ignore, or censor critical reviews and low ratings. Businesses and consumers alike are wrestling with the problem of fake online reviews. In an attempt to manufacture a five-star reputation, some companies are gaming the system by posting fake positive reviews of themselves or bashing the competition on online feedback channels and social media. Don’t employ these dirty tactics. Consumers are scrutinizing online reviews more closely than ever, and inauthentic, fraudulent content on your digital properties will no doubt leave you at risk of severe reputational damage. Smart businesses look beyond star ratings and pay close attention to the text content of their reviews. Already, many are investing in tools like word clouds, sentiment analysis, and review management software in order to generate data-driven insights on the customer experience, as well as leverage customer feedback to drive sales and performance. After all, people will have varying definitions of what counts as a five-star or one-star business. By analyzing in greater detail the information that comes directly from your customers, your organization can make smarter marketing decisions, not least in the area of online reputation management. Here at ReviewTrackers, we regularly advise clients to encourage feedback, especially in post-transactional situations. Reach out to your customers. Conduct surveys. Make review requests. Send E-mails, then follow up on those E-mails. According to PowerReviews, 4 in 5 will, in fact, leave reviews after being prompted by the business. 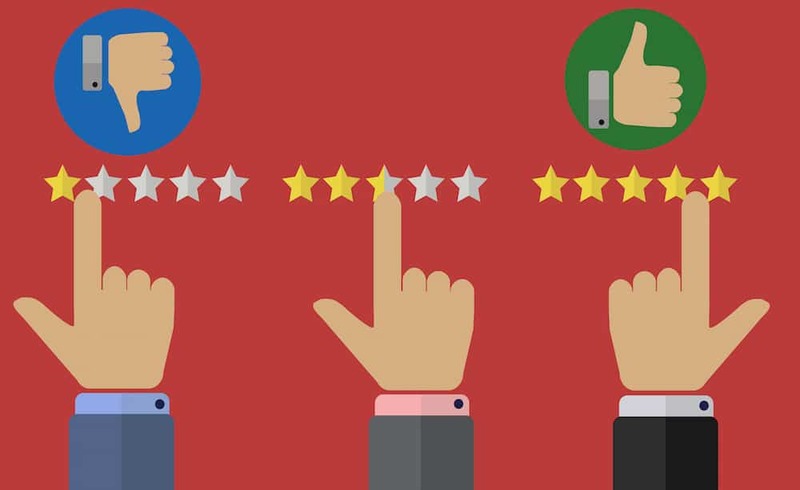 There is no guarantee that customers will give five stars, of course, but your organization’s ability to generate new reviews, regardless of rating or sentiment, can have a major impact on sales. It’s even handier when most of the reviews you’re getting are short — in which case, quantity matters. Does your organization really want five-star reviews across the board? Some will say the right answer lies somewhere between yes and no, but it’s probably the wrong question to ask anyway. Five-star reviews and ratings are not the be-all and end-all of your reputation. At a time when consumers value authenticity more than perfection, your business should do the same.